An Accra Central District Court, on Friday, turned down the bail applications put in for three persons arrested in possession of seven hand grenades at Kwashieman, Accra. The accused are Ismail Ali Musah, 32 years; Abdul Karim Yakubu, 30 years; and Osman Alhassan 33 years. 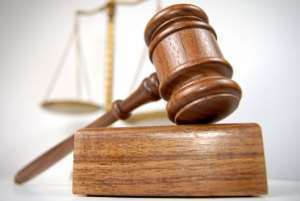 The court presided over by Mr Ebenezer Kweku Ansah said he was mindful to the fact that if the accused persons were admitted to bail they might not appear to stand trial, as the explosives found in their possession were not available on the market. The court said it also took a view of the fact that the charge preferred against the accused persons was a first-degree felony so the accused persons may abscond. According to her, her prayer was going to border on the jurisdiction of the court adding, 'The accused persons have been charged with possession of explosives and this is beyond the jurisdiction of the court to grant bail'. The Senior State Attorney recounted that the Attorney General received the duplicate docket on February 21 to study and advice on the case docket. 'We have out of respect, made an appearance to pray that we need some time to study and put our legal opinions through,' she said. Defence Counsel George Asamaney, counsel for Alhassan, stated that the State's action was unfamiliar to Ghana's jurisprudence. According to Mr Asamaney, the Attorney General was fully represented throughout the proceedings, adding that, the State's action was not supported by any provisions of the Court Procedure Code. Mr Felix Aboagye, who represented the rest of the accused persons, associated himself with Mr Asamaney's submissions. The Defence counsels had earlier prayed the court to admit the accused persons to bail since they had been in incarceration since January 15, this year. According to them, the Prosecution had asserted that they had completed investigations. Detective Chief Inspector Simon Apiorsornu objected to the granting of bail, saying the matter was of national security concerns. The pleas of accused persons, charged with the possession of explosives, have not been taken. The case of prosecution is that the three accused persons were arrested in a house behind the Kata Hostel near Kwashieman following a tip off. The Prosecution said the Police arrested Yakubu at the Kata Hostel with the seven grenades and when he was quizzed, he disclosed that he bought them from Musah and Alhassan, who he led the Police to arrest.